It’s traditional for Mr. Glad to have homemade blackberry pie for his birthday, which arrives at the peak of the wild blackberry season here in Northern California. As a young couple we did our first picking up near the Eel River when we were just making hopeful forays northward, thinking about where to move to when our college days were done. Later we had the bushes growing like weeds in our back yard and neighborhood, and the children could bring in plenty, so much that there were many more berries than I could bake into pies. I developed a recipe for blackberry syrup to process in jars so that year by year we had it to pour on pancakes. Twenty years ago we moved to a less rural part of the county and now have to make more of an effort to collect our pie ingredients. 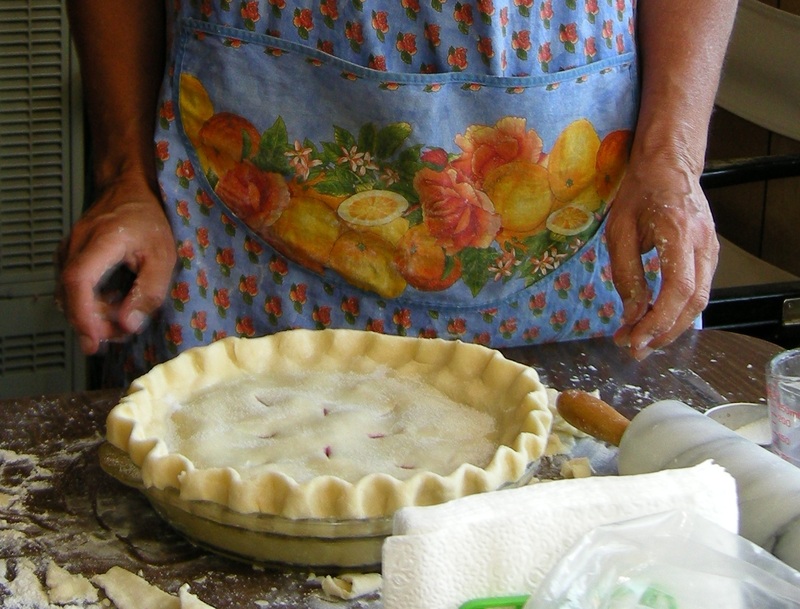 In the last few years it has twice happened that one or two of the children made heroic efforts against busy schedules and blazing heat to collect buckets full enough for me to bake the customary pie or two. 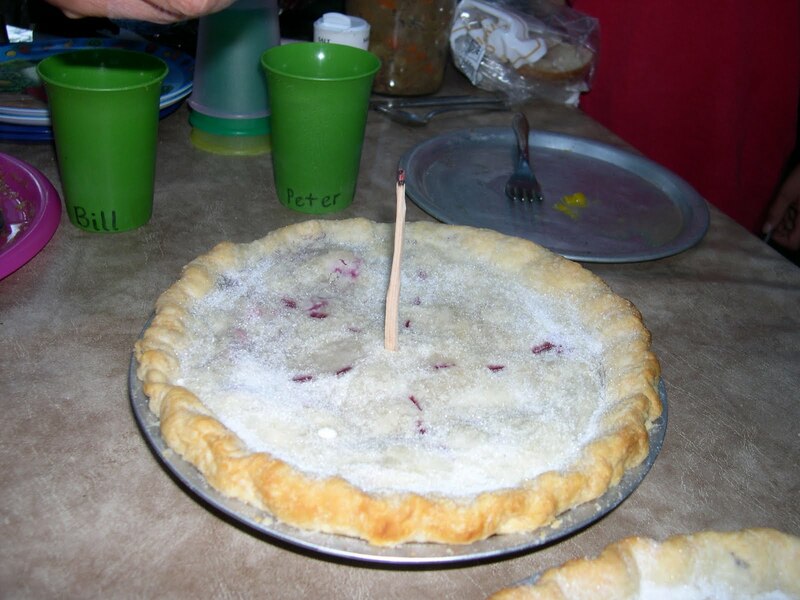 One year I carted one of these pies up the mountain for our Yosemite family camp experience, and forgot the birthday candle. Someone carved a sort of long matchstick from a twig to use instead, but it was pretty much a failure. At left is the time I baked a blackberry pie at the high mountain cabin where I like to go for solitary retreats or for family gatherings where cooking is appreciated. This busy-busy summer, there was hardly time for a spark of thought about going berry-picking, so I picked up two bags of mixed frozen berries at Costco with plans to make four pies for the big party that the children were giving B.
I’d used this berry mix once before, to make my usual blackberry pie recipe, the result being a kind of gummy candy wrapped in pastry. As the berries are individually quick-frozen, I speculated that they lose a lot of moisture in the process and must need less thickening than what I’d automatically put in the bowl. So this time around, I used less than half the amount of tapioca granules called for in the original Joy of Cooking recipe. A little runny would be better than globby. And the pies were a little runny, so if I do it again I’ll use exactly half the thickening. Getting the edge of the crust to look nice is not the easiest part of pie-making. It took me quite a few failed attempts in my youth before someone showed me to hold the top and bottom layers of crust together as one, while you fold them under, against the edge of the plate. Now you are all ready to flute the edge, if you want. My pinching technique is shown at right in a photo I had B. snap for me. Click on it if you want to see it large. 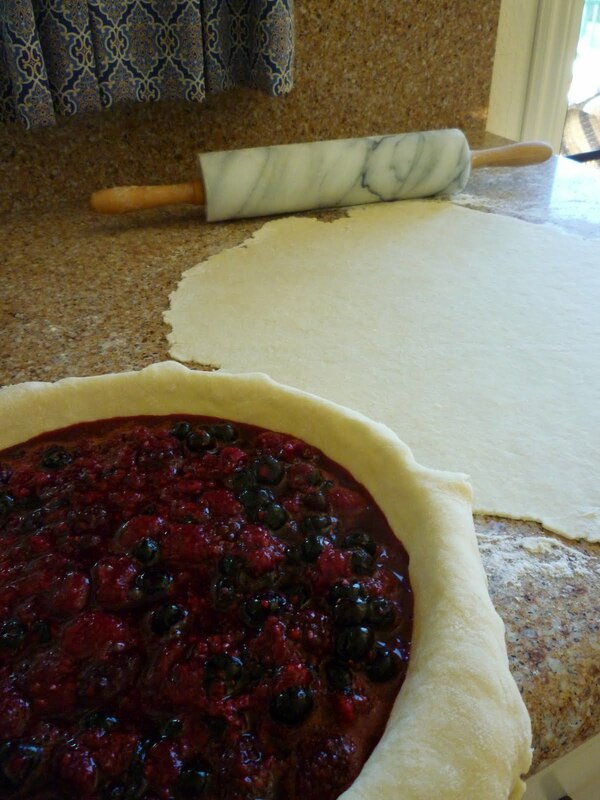 It seems hard to bake a berry pie without the blue showing through the top crust. 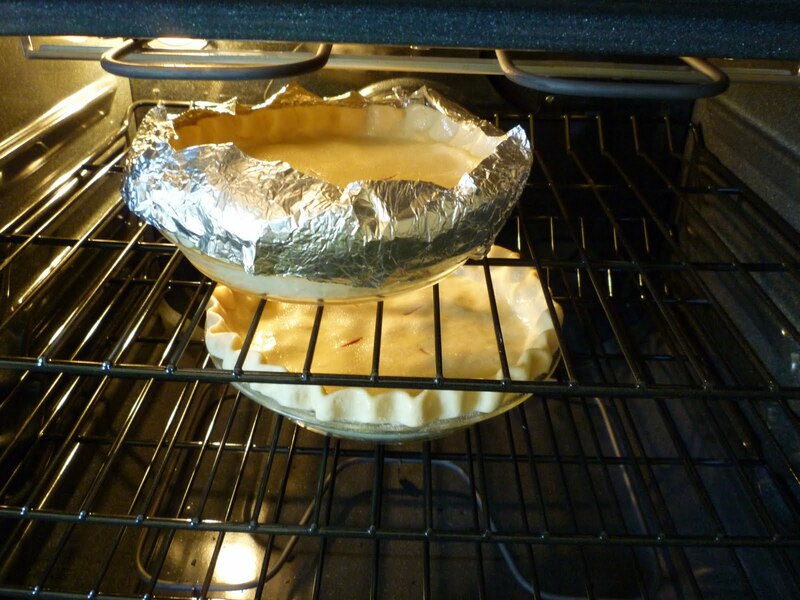 Two of the pies I put an egg wash on, and two not. Two had a little less butter in the crust. But they all came out looking about the same. What was really different was baking them in a convection oven. With the first two pies, I experimented and used the foil collar on one and not on the other, and they baked equally, beautifully brown. So I may not use foil collars ever again! 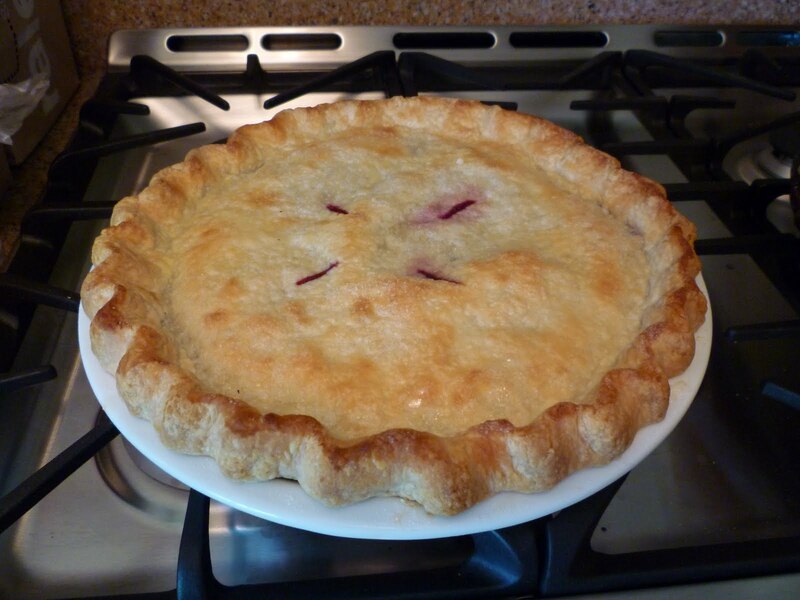 The flavor was excellent, a composite of blackberries (Marionberries, to be precise), blueberries, and raspberries, with butter seeping in from the crust, and a bit of cinnamon with the fruit. I go lightly on the sugar so that the sweetness doesn’t overwhelm the taste buds. It was a wonderful party the children had for their beloved father, and he was very pleased not to have to go without his pie. those look so yummy. I love pies more than cake too and I think blackberry would be my favorite of the fruit pies. What a lovely job you've done too. Oh yum! Any berry pie is my favorite, but I really love blackberry! I love nothing more than a mix of berries in a pie. Yummmmm. And your crust looks really delicious. 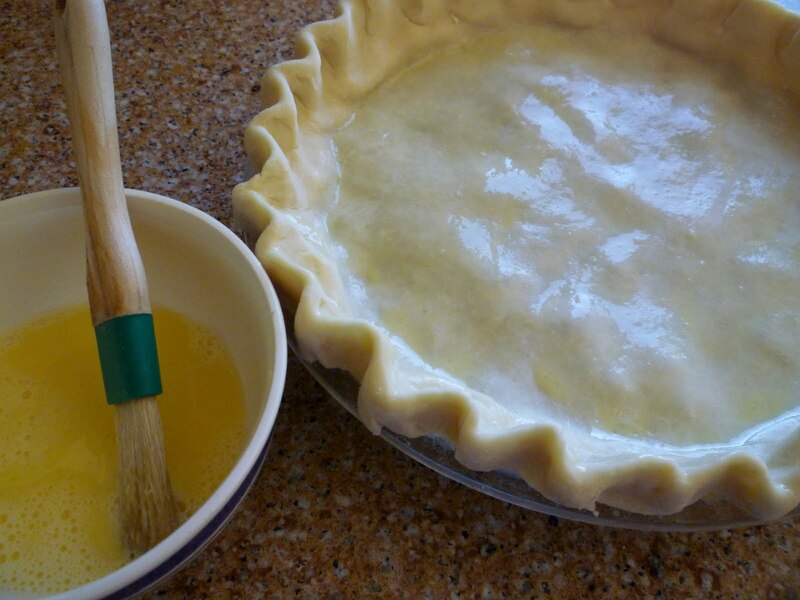 Pie crust has got to be one of my favorite things, too. Oh, how delicious! I love fruit pies 🙂 B. has excellent taste, and it was fun to see the various pies you've made over the years. 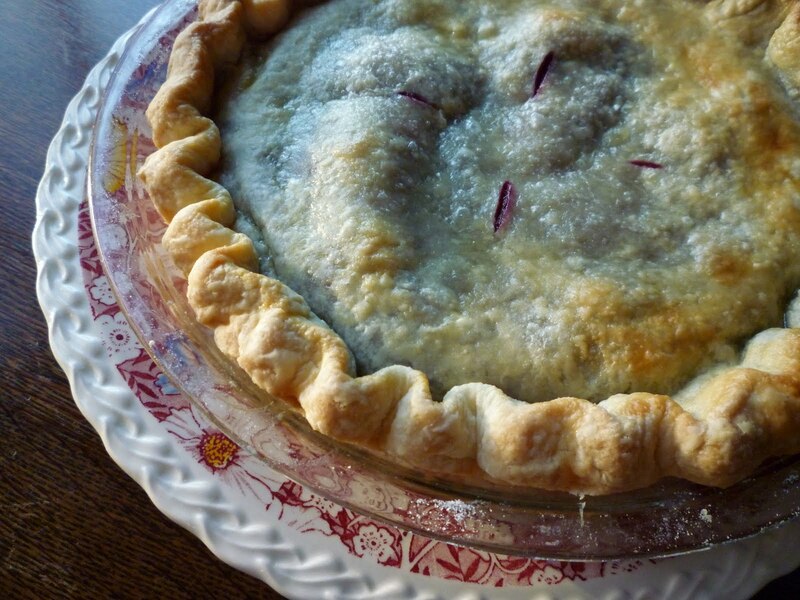 Blackberry pie seems to be the quintessential flavor of summer. What a beautiful pie! And I very much enjoyed the pictures of your pie-making process. 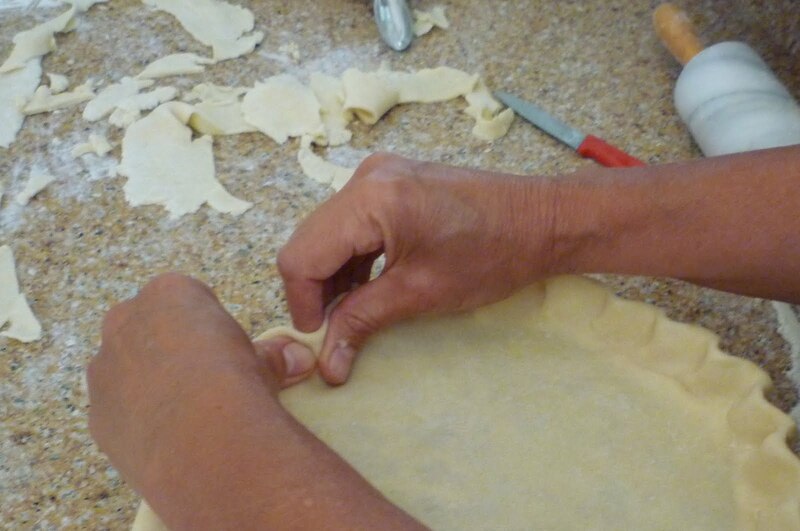 I never knew how to flute the crust until I started making chicken pies at church and someone showed me how. What a fine thing to learn! I made a peach pie today! And as I do every time I go to flute a crust, I remember how many years it took me to be able to imitate your gorgeous crusts! I think my fingers were just too small until I grew up. Anyway, your pictures are making me drool! I prefer pie over cake and your pies look delicious, and gorgeous, too! Scrumptious! 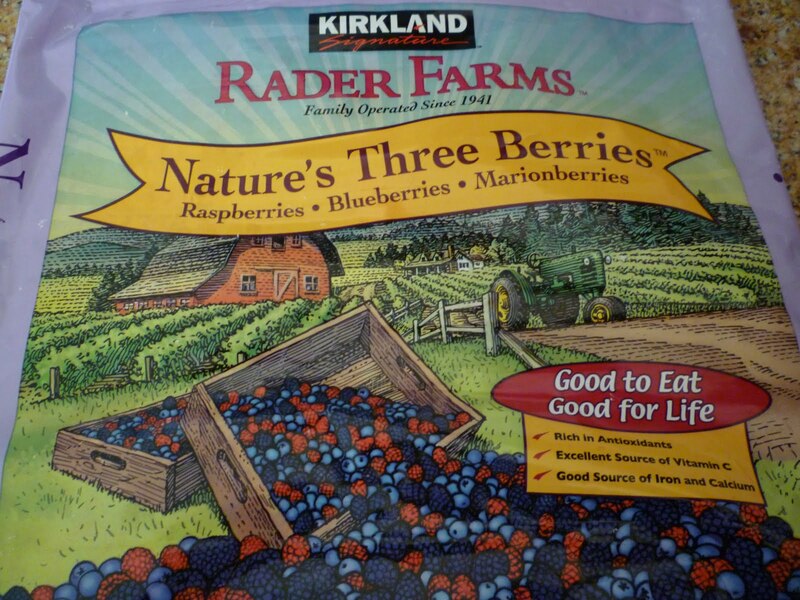 I think I'm going to buy a bag of frozen berries and make myself a pie…yum! Where do you get tapioca granules? I love homemade crusts…never buy them, they are really not TOO hard. I usually use all butter. I recently found a recipe that calls for 1/2 butter and 1/2 cream cheese, flour, salt and water…I'll have to try it out!!! They all look so delectable I had to comment! My pies taste merely all right — good filling, blah crust — but you are clearly an artist of pastry. Your pies are perfect! We had a boy in our neighborhood who scouted the woods for berries. His mother always made the best wild blackberry pies, I think. I guess we were so mad at him for beating us to the blackberry bushes, we were never invited over for pie! Berries ripe on the bush is one of the missing ingredients “down here.” Blackberry, straight up, is hands down my favorite pie. Many of our preferences are worked into us early I believe…this is certainly true of blackberries and me. I imagine what a sweet thing it would be for some young person who hasn't had someone to watch making and baking, come upon your blog and find so much guidance…in the many realms in which you reach and do and give. A peaceful week to you…this special week. Thank you for your comment on my blog… those fun out of nowhere comments that give me a pick into someone elses corner of internet land are so delightful. Please come back and read anytime you like. God Bless! I adore pie. Any kind. Your berry pie looks scrumtch! B. is blessed to have your good hands baking him birthday pies. I enjoyed watching you bake. Marfa, nowadays I can get granulated tapioca through my food co-op, but for years I found it in a little box in the pudding aisle at the market, as Instant Tapioca. Sometimes in a pinch I run some small tapioca pearls through the blender. They look scrumptious! You have perfected the art of beautiful pies! My children have been diligently picking blackberries every other day in the hope that I will make them a blackberry pie when/if we have enough berries.